Rhapsody is open now!! There are several sections of music genres like Country, Pop, Electronic, Classic Rock, etc. And all the items are inspired by their genre! I am loving it! In the Country section, you’ll find a sweet dress called County Rd. 22 by Coquet. I love the split sleeves and the sheer band around the bottom of the skirt. The dress is quite low cut and I’m not all about showing off the goods these days, so I slipped an old tank top underneath. But if you love showing cleavage, then this is really the dress for you! Elephante Poses is also at Rhapsody in the Electronic section and I’m using a pose from the Bounce pack! I love love love when people do packs of single poses for events rather than just couples poses, which is what I see mostly. Not that I don’t enjoy a good couples or group pose, but I am forever in need of singles for blogging! Rhapsody is brought to you by The Hottie Cooterati Experience and runs from now until July 12th. So it’s been a lazy week for me. *laughs* I took these pictures a couple of days ago because I adore everything I’m wearing, but I just haven’t had my blogger brain switch turned on. We’ll keep this short today! There have been new releases from Coldlogic, L.Warwick, and Truth in the past week, all perfect for summer. The Liaison Collabortive started their new round this weekend with its Bali theme, and you’ll find a lot of cute summery things out there, too. You have a few more days to head out to Fashion For Life! And you really should, because not only will you be supporting a great cause, but you can buy this outfit from Likka House! I don’t get a chance to blog a lot of fantasy type outfits because it’s not my normal style, but once in a while, there’s just something so fanciful, I can’t help but dress up! 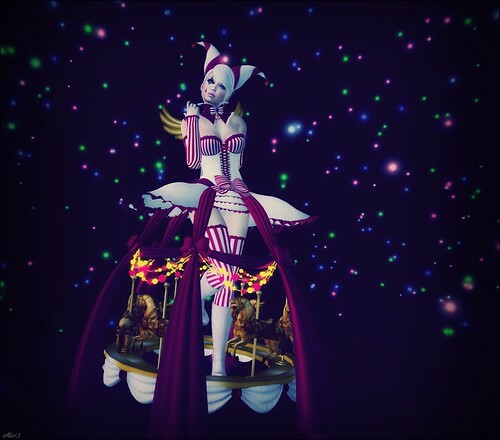 The East Of The Sun carousel outfit is just so much fun! It comes with several pieces, so you don’t have to wear everything all at once. But you have to admit, it looks pretty darn cool with everything. There is even an gesture you can play to turn the carousel on so your horses spin! Too cute! You can find Likka House on the Journey sim at Fashion For Life. The event ends on June 20th, so get on over there quick! Just a quick post today because I love my dress! You may know Rebel Hope as more of a fancy gown store, but when she does casual, it’s just as gorgeous! The new Janet dresses are just adorable! If you’re looking for a simple, easy look for the summer, this dress is definitely for you. If you’re looking for some great heels, be sure to check out Ingenue‘s Lola heels for Collarbor88 this month. They are slingback peep-toes with a high high heel and come in several pretty colors. They are for the Slink High feet. Did you know that Fashion For Life has started? Yep! If you love shopping and charity, this is totally your event. There are 10 sims of amazing shopping and you will be supporting Relay For Life, which raises funds for the American Cancer Society. It’s a wonderful event, and really? Who isn’t down with shopping? SySy’s is out at Fashion For Life on the Trek sim and she’s made the cutest little summer dresses called Wanderette. It’s a simple slip dress but I find that the colors and textures she’s chosen really make this dress pop! There are 6 color combinations. Bliensen + MaiTai are also out at Fashion For Life on the Wander sim. This is one of my longtime favorite jewelry stores, so of course I’m pleased to see them there! I just adore the Yasemine necklace! It has several color options that you can change with a HUD so you can really get it to work with any outfit. Fashion For Life runs until June 20th, so I hope to see you all out there! So have you guys been having as much fun with stuff from The Arcade as I have?? My list is almost complete! Pretty good for it only being 5 days in to a month long event, don’t you think? But let’s not forget that our regular events are going on too, like FaMESHed and Fit For A Princess! Zenith stole my heart at FaMESHed this month with the Hippie Dress and the Hippie Leather hair accessory! The dress is just totally my style and I wish that more people in SL made more cute, boho type clothes. And who can resist hair things? Not me! And okay, can we talk about the Fairies from !Ohmai and the Gnomes from Mutresse for a minute? When I saw the ads for these for The Arcade, I KNEW I would need them just for this little garden we have in the backyard. You can wear the companion fairies, but if you rez them out, you can just have them all over!! They’re small, but mod to be bigger quite well. And the little gnomes resize, too! Squee! Have a wonderful, magical day!